Merenda is the Italian word for "afternoon snack". 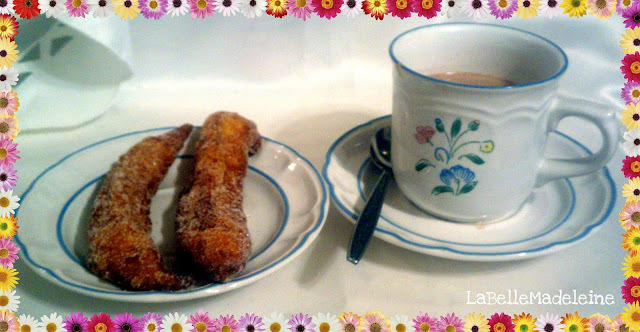 Today, under my husband's request, I made Churros for the first time! I found the recipe on the online magazine Bon Appetit, one of my favorite magazines. They are basically fried eggy dough covered with sugar. They didn't come out too bad, the frying oil was probably a little too hot so they came out crunchy on the outside but not completely cooked inside. They were edible though... they are almost all gone! :) I also served, to my husband and children, a delicious hot chocolate. It was great!! Here's a picture taken earlier to show you how they came out! Bon Appétit!! This looks delicious! The hometown I grew up on used to have so many churro carts around town to buy these from, but yet, I've never had any! I definitely need to now!